Well, I’ve done the math, and it turns out that I can get everything accomplished on my to-do list before heading to California for Christmas so long as I send a few items to the cutting floor. Like sleeping and showering. Either way, I need to make sure I have plenty of yummy food on hand for quick energy boosts in the coming days and weeks. I have the very thing, as well as the extremely short list of ingredients required: stuffed dates. 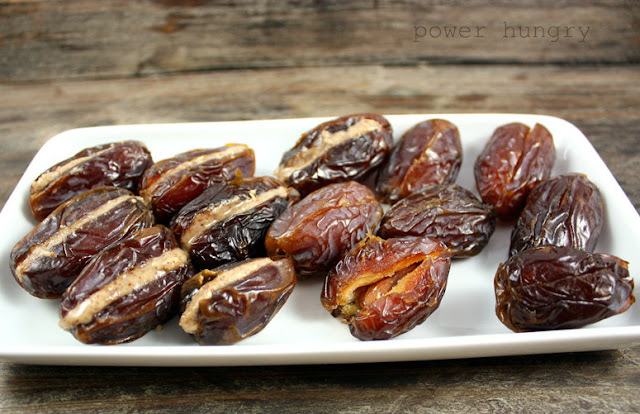 (1) whole pitted dates (preferably gooey-soft, unctuous ones, like Medjool). (2) natural almond butter (or other nut or seed butter, like peanut, cashew, sunflower or hemp). (3) 5 minutes (you can multitask by taking a phone call as you stuff, but avoid wrapping packages; it gets ugly). 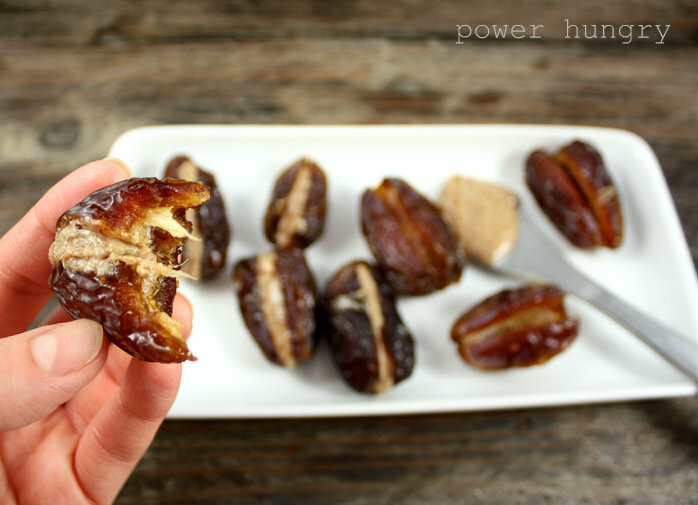 (3) Scoop a generous teaspoon of nut/seed butter inside date. 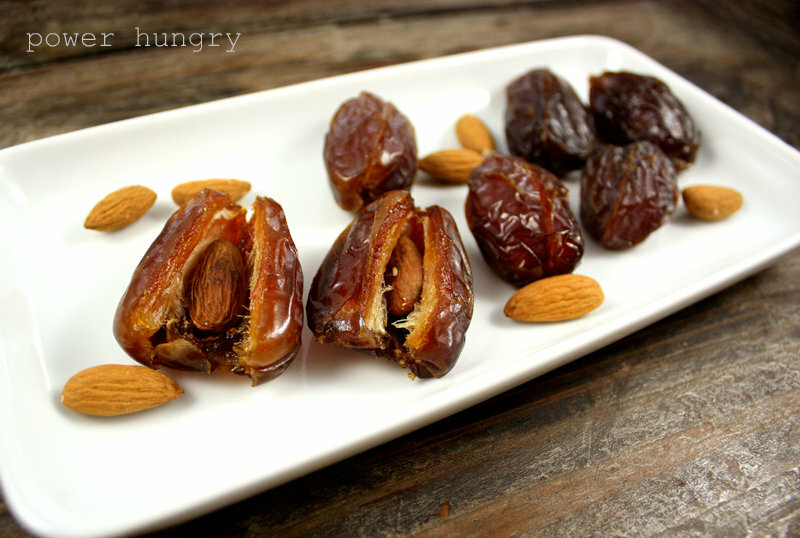 (5) Eat, and/or continue process with as many dates as you like. 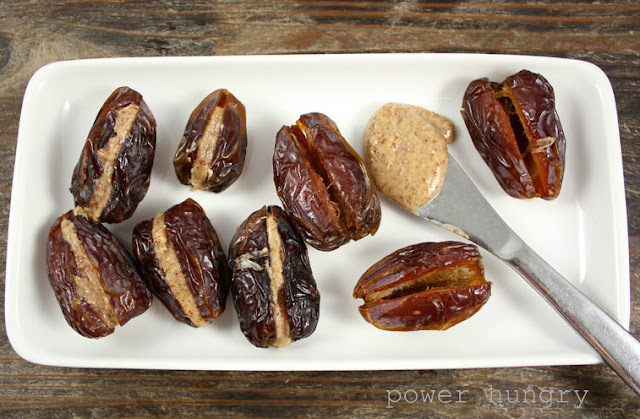 Delicious immediately, the dates are even better if you chill them)in an airtight container) for at least 1-2 hours until the nut butter is firm (the beauty of natural nut and seeds butters is they firm up when cold). I know what you’re thinking: nut butter? dates? Big deal! But trust me–the sum is far greater than the parts (especially if you are patient enough to give them a chill). It is essentially, a deconstructed cookie dough LaraBar. The petite, candy-like quality is perfect for countering holiday sweets cravings (not that I am giving up holiday sweets, but having some of these power bites on hand helps me keep a reasonable balance). You can use whole nuts–raw or toasted–instead of the nut butter! I am soooo addicted to these now! This is now my go-to mid-afternoon snack (my filling of choice is usually peanut butter). Hi Lisa! Always so good to hear from you 🙂 So glad you love these, too. Peanut butter still reigns supreme for me, too (although sunflower seed butter comes in a close second). This looks like a great post workout snack!